Have extra shelves left over from your storage units? Versatile. Strong. Lightweight. Our wire shelving posts provide incredibly flexible solutions offering a variety of options for display and storage. The smooth, tarnish resistant chrome finish is easy to clean and looks great in any environment. It's ideal for retail displays, store rooms, catering, hardware stores, and even in the home. For professional merchandising or efficient storage our range of wire shelves and post extensions offer the perfect solution. As well as looking good, this shelving is also very strong. Post extensions come in a wide choice of available specifications and colors. All our wire shelving products and shelving posts are NSF listed and certified. They are easy to clean and adhere to sanitation standards. We carry everything from smaller, multi-purpose wire storage racks to heavy duty, industrial wire storage racks. 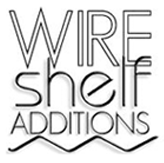 Wire Shelf Additions also offers additional shelving, post extensions, casters, racks, dividers and a range of wire rack accessories. Wire shelving posts come in a 4-pack or can be purchased as a complete rack set. If you are already using a wire rack, we sell adjustable wire shelving feet so you can level the units on uneven surfaces. This makes chrome wire shelving posts truly modular and highly versatile. Wire shelving, shelving posts, and other accessories come in a flat pack and assembles in minutes, without the need for any tools. Effortless assembly and disassembly makes the wire shelving easy to transport or store away when not in use. If you already have a starter unit you can connect as many add-on units as you need. The advantage is that you get to use existing wire shelving posts from the previous unit to support the shelves of the next unit.